Frank Wildhorn is a man that exceeds explanation when it comes to his accomplishments. He has adapted several famous literary works into well-received (at least by fans) stage musicals, including The Strange Case of Dr. Jekyll and Mr. Hyde, Alice's Adventures in Wonderland, and Bram Stoker's Dracula. He has composed every single one of his works, and has been nominated for three Tonys and three Drama Desk Awards. He is a credit to the performing arts, and I think he deserves a place on this site because of his accomplishments. Frank Wildhorn's official blog/website. It has every aspect of information concerning his career, a biography, a list of his works and projects, and even a photo gallery and mailing list. I'm sorry, but I consider Wikipedia to be a legitimate resource if its connecting resources are legitimate. The Wikipedia page has many interesting and informative facts about Wildhorn, and even goes into detail about Wonderland (a personal favorite of mine). A little page with a list of his works, related news, and related links to actors that have worked with him. BroadwayWorld is useful when it comes to learning about composers and directors as well as actors, and Frank Wildhorn's page is chock-full of information. Jack Johnson was born on May 18, 1975. His music would be described as alternative and wiki describes him as American folk. He is a singer-songwriter, surfer and musician known for his work in the soft rock and acoustic genres. In 2001, he achieved commercial success after the release of his debut album, Brushfire Fairytales. He has since released four more albums, not including the albums involving surfing movies and soundtracks. His four albums are titled; Brushfire Fairytales, On an On, Sleep through the Static and In Between Dreams. My personal favorite would have to be In Between Dreams, as that was his first album I fell in love with. He currently has sold 15 million albums worldwide. His highest–selling album is Sing-A-Longs and Lullabies for the Film Curious George, with 4 million albums shipped worldwide, due to the success of the 2006 Curious George film. Nonetheless, this album would sell not only to the usual fans, but to children as well. 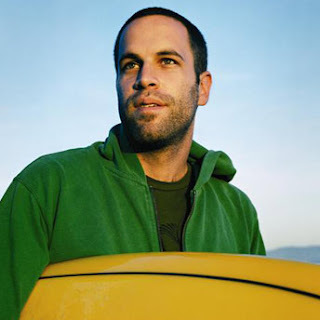 Notable songs from Jack Johnson include "Upside Down"; "Flake"; "Sitting, Waiting, Wishing"; "If I Had Eyes"; "You and Your Heart" and "Better Together". My favorite song would have to be either “Flake” or “If I Had Eyes”. They both entail meaningful lyrics with good rhythm. Jack Johnson is mainly based on his acoustic guitar and some bass with drums, however, these songs include the best of everything. I fell in love with Jack Johnson seven years ago on a trip to Hawaii (where Jack is from). The family I went to Hawaii with loved Jack Johnson and we listened to his music every day. The calm ease of his music made his albums easy to listen through, and his clever lyrics and guitar chords made the songs memorable. Fortunately, I was able to attend a concert of his about three years ago, and I will never forget how amazing of a musician he is. Not only can he play his guitar with ease, but he can also sing his songs just as you would expect to hear from his album. The best part of the concert was the fact that I was in the front row and could feel the energy and emotion he had in his music. He actually enjoys what he does and wants to share his brilliant lyrics and talents with others. This site includes his news, tour information, photos, music, video (including filmogrophy he was involved in), and a store where you can purchase merchandise and albums. This is Jack Johnson’s main website as you can tell it represents him. He is a very laid back guy with his family and guitar as priorities. His newest album is showcased throughout the website. Of course, Jack Jonson is a very thankful and giving person, so he has a big thank you page for his fans from all of his tours, and a campaign for recycling. The recycling campaign is labeled under his “greening” tab. Thus, this website entails how amazing of a person Jack is, while also including his musical information. Myspace is an important website for Jack as it shows his latest music, and you can play through each song in the virtual album he posted. Myspace allows for new and favorite tracks to be played, as well as witnessing first hand his newest album. While listening to his newest music, you can look through his latest photos and friends. Nonetheless, this is another opportunity to blog for Jack and witness firsthand what he has been up to lately; involving music, pictures, videos, streams, and friends. This website is different than the other two in that this website promotes Jack Johnson, but other artists that are similar to him. Of course, Jack Johnson is first on the list, and when you click on his link you learn about his newest album and tours which to me is great, however, this website adds a new dimension of adding a producer side of the story. As a fan of his music and his franchise, this was a very interesting website for me to view. 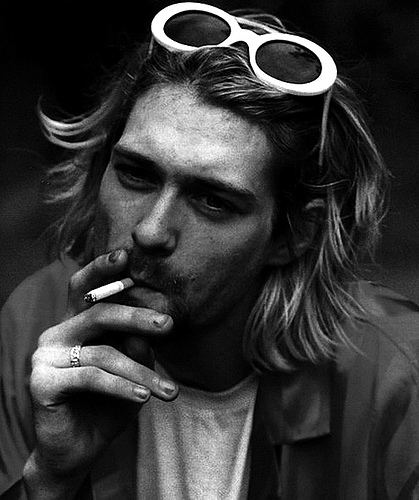 Kurt Cobain is considered one of the forerunners in creating "grunge" music. His band, Nirvana, surfaced in the early 1990's in Seattle with a unique and different sound, quickly gaining popularity around the country. Cobain was ranked the 12th greatest guitarist according to Rolling Stone. His music was an emotional journey for many listeners, and especially hit people in the age range of 13-25. His music was about angst, and captured the emotions of growing up. As many rockers do, Kurt Cobain got wrapped up in drugs and alcohol, and became very depressed towards the end of his life. He fought an addiction to heroin, and was constantly worried about how the public was perceiving him, and that his audience wasn't getting the correct message from his music. He was married to Courtney Love, and had a daughter, Frances Bean Cobain. Kurt Cobain sadly died April 8, 2004. The main theory is that he committed suicide, leaving behind a suicide note, with a shotgun lying on his chest. There are many other theories that he was murdered, or that it was a homicide. However he died, it was a tragic event in many people's lives. Cobain was an inspirational artist to many, and his music continues to be played on all major radio stations. This website provides more recent information about Kurt Cobain and events surrounding him and his music. It also contains biographies, and links to interviews. This link provides a complete list of every song released by Nirvana. There is all of the main conspiracies of Cobain's death listed on this website. It explains each conspiracy, and the proof behind it. Andy Goldsworthy is considered the founder of modern rock balancing, an art that involves balancing rocks on top of one another. But Goldsworthy is more than a rock balancer. This British artist is also a naturalist, sculptor, photographer, and author of many books. Born in 1956, Goldsworthy was raised in Yorkshire, England where he spent much of his childhood outdoors. This is reflected in his sculptures which are made of materials found only in nature such as rocks, clay, snow, twigs, leaves, and flowers. Because he builds his sculptures outdoors where they are fully exposed to the forces of nature, his artwork is ephemeral. Just one gust of wind could completely destroy a piece of art that took hours or even days to build. However, Goldsworthy finds a way to overcome these forces; he uses photography to document his often short-lived sculptures in time. Information about the artist & examples of his work. This site features his biography, philosophy, examples of his works, and list of exhibitions between 2002 and 2004. The examples of his works include short descriptions which are similar to the style found in his books. Find a list of his books here. This is a bibliography of his books posted by a fan. There are twenty total and may be a useful list if interested in purchasing or locating one of his books in a library. This link allows you to access details, reviews, and a message board for the documentary film directed by Thomas Riedelsheimer - River and Tides: Andy Goldsworthy Working with Time. The movie was rated 7.9 by IMDB users! 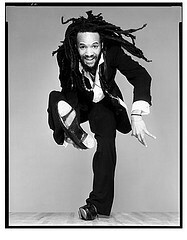 Today Savion Glover may be known for his tap dancing roles in pop culture hits such as Happy Feet, and Sesame Street. However, Savion is one of the leading tap dance performers and choreographers. He began playing the drums at the age of four. By the age of seven he wanted to start putting those rhythms to use with his feet, and quickly picked up the style and moves of tap dance. His first big role was the lead in Tap Dance Kid. After this role, word spread about this young prodigy. He was asked to play a role in a new show titled Black and Blue. While over in Paris performing Black and Blue he was able to connect with older tap generations. These experienced tap dancers passed down the history and their individual styles to Savion. These mentor-ships continued throughout his career. He was taught by some of the most well known performers such as Gregory Hines and Sammy Davis Jr. When he was a teenager he opened up his own dance school, HooFeRzCLuB School for Tap in his home town of Newark, New Jersey. In 1996 Glover choreographed and led a main role in the production of Bring in Da Noise Bring in Da Funk. This show went on to win a Savion his first Tony award. Savion is important to the world of dance because he has brought back the original styles of Tap as well as working to keep the art form alive. He ties African American history into the storyline of his performances. He also likes to be new, innovative, and show that dance can be taken to the next level. He was the first to introduce a funk style to tap and to Broadway. To him tap is a self expression of your emotions not just an exercise. One quote that stood out to me was that, "The beat is basically what takes you through life,” when asked what his approach to dance was. Once you see him perform onstage you see that it’s not about the presentation and the costumes, it’s about his hard hitting sounds and the rhythms he creates. His goal is to keep dancing alive and pass down all of the knowledge and unique styles of past generations of tappers. This first link is to a video of Savion on Steven Colbert’s show. It’s a humorous interview that shows Savion’s personality. He talks a little about the history of tap and his approach to the dance. At the end he does some tap demonstrations. I would highly recommend watching the end of the clip to see the amazing rhythms and sounds he is able to create. This website gives a very extensive biography of his life, accomplishments, and awards. The background history is very detailed and the lists of his performances and appearances are accurately compiled. This is a link to Savion’s official facebook page. It gives some background history and some basic information. On the wall it shows some of his upcoming performances as well as some videos of performances. You can see how many fans look up to him. It also has links to his website and the site for his dance school. This is a link to a youtube video showcasing some of Savion’s amazing talent. It is worth the watch, this short clip demonstrates the amazing sounds and rhythms patterns as well as his over artistic ability. Tom Morello is a singer/songwriter/musician. He is most notable for his roles in bands such as Rage Against the Machine, Audioslave, and his solo acoustic act The Nightwatchman. Morello is easily identified by his use of effects in his playing, using different sounds and processors to create totally new and innovative sounds that make the guitar sounds like a completely different instrument. 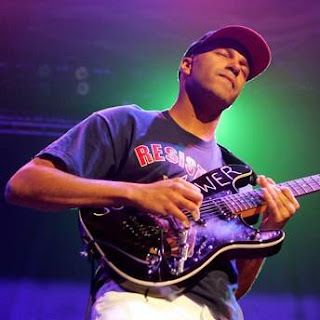 Most of the musical acts that Morello has been in have been politically charged (especially Rage Against the Machine), and have performed at places such as the Democratic National Convention in 2000. What really draws me to this artist is the way he plays the guitar and simply because of the kind of person he is. The kinds of sounds that Morello is able to produce are incredibly interesting, almost DJ-like in sounds, which nobody else is able to reproduce. He has created a whole new vast array of sounds and textures with the guitar that work perfectly within the music he plays. He is also a Harvard graduate with a degree in political science, which speaks to me in a way that not many other rock musicians do, considering he has obtained a degree at such a prestigious school while still touring and playing in many highly popular bands. Because of this, I give weight and equity to his political views and ideas, which are easily heard throughout his music. This is the official site for Morello’s Nightwatchman act. Fans can learn all about his music as well as the groups and organizations he supports. This is a youtube video of Tom on MTV demonstrating to the audience some of the cool sounds he can make on the guitar, as well as explaining how he creates them. A quick overview of Tom Morello including some of his most popular songs and bands that he has played in. Although short, the site touches on some of his most notable achievements and music and is good for getting an idea of what his music is like. My artist of choice is musician J Mascis. 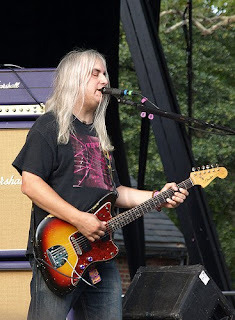 He is a solo recording artist and frontman for 1980's indie rock band Dinosaur Jr. He is considered largely responsible for bringing the lead guitar back into independent rock. His self aggrandizing song writing, high gain, wall of sound style helped lay the ground for the breakthrough of alternative rock in the 1990's. Early releases were more structurally experimental, often veering off into free form noise before being brought back by his Neil Young inspired vocals. He later settled into a more predictable but still satisfying pattern, using Dinosaur Jr. and his solo work as a vehicle for songwriting rather than experimentation. His more recent writing has lacked the self-hate of his previous work, instead reminiscing over how his past problems have made him into the person her currently is. He is considered one of the most influential guitarists in modern rock. His slowly evolving style has, over the past twenty years, given his listeners a unique portrait of who he is as a musician and a person. He is currently signed to Sub Pop records. This gives a brief introduction to him as an artist and talks about his new album. This is off his official website and gives a longer artistic history and focuses less on current work. This is about the history and influence of his band, Dinosaur Jr. It traces their history to the present day and features comments about their effect on popular music at various points in their career. Since the late 1990s, Usher Terry Raymond, also known as Usher has been a musical sensation. Usher has the whole package from being a popular singer, dancer and overall a great entertainer because from his catchy dance music “Yeah” to his slow jams, a number one hit called “Nice and slow”. His popular songs are for everyone to enjoy. The RIAA ranks Usher as one of best-selling artists in American history, selling over 23 million copies only in America. Born October 14, 1978 and born in Dallas, Texas. Even when Usher was at a young age, many of Usher’s family members noticed his musical talents and star quality. When Usher was nine he joined a church choir and later he joined an R&B quintet called NuBeginnings. Usher has produced five albums and recently produced his latest album called Raymond V. Raymond. Usher music is also universal where many other generations can appreciate his work. I have seen many of the younger generation can enjoy the catchy beats and older generations who can also appreciate his work. One reason why I think Usher is a memorable artist is because I grew up with his music, in the 1990s I listened to his slow jams of “Nice and Slow” and even now when I am in the gym his catchy dance music pumps me up to work out harder. Unlike many artists today, Usher is not just a new fad that will not be remembered in future generations; he is known as the king of R&B and will be remembered in future generations. Ushernow.com is Usher’s official website. This website includes information about Usher’s career with his music and his personal life. There is also a subtitle to find out Usher’s current tour dates and a shop online to buy his merchandise. This is Usher’s Facebook page. This Facebook page keeps up to date information of Usher through posting status updates. This Facebook page also has videos of Usher’s music and personal videos. This Facebook page is also linked to other networking sites such as Twitter. This website shows Usher’s biography, a list of albums, and different TV shows he has been a guest star in. There is also a section of “trivia” that list random facts of Usher’s life. In the end of the page there is a section of personal quotes and a section on what he is doing now. John Adams is one of the most significant composers today and his music is probably the most played of any living American composer. After completing his education at Harvard University, John Adams got his start as a professional composer while teaching at the San Francisco Conservatory of Music in the 1970's. Adams was inspired by the minimalist music of Philip Glass, Steve Reich and Teri Riley and decided to take his method of composition in that direction. Minimalist music is characterized by slowly-evolving musical materials through layering and gradual, subtle shifts in tonality. Minimalist music has a tendency to put the listener into a trance. If one focuses hard enough on the music, hidden rhythms, melodies, or other relations between musical materials may be revealed which increases the pleasure of listening to the style. Some of his earliest pieces such as Shaker Loops (1978) and Phrygian Gates (1978) are in the minimalist style. Adams was able to commit more time to being a full time composer when he became composer-in-residence for the San Francisco Symphony (SFS) in 1982. It was through his association with the SFS that many of his works, such as Harmonium (1980-81) and Grand Pianola Music (1982), received their first performances. Adams achieved worldwide fame as a composer with his operas Nixon in China (1985-87) and The Death of Klinghoffer (1990-91). One of his most recent operas is Dr. Atomic (2004-05) which is about Robert Oppenheimer and the creation of the world's first atomic bomb. Adams has written a couple really great concertos including two piano concertos (Eros Piano (1989) and Century Rolls (1996)), the Violin Concerto (1993) and Dharma at Big Sur (2003), which is a electric-violin concerto. Adams received a Pulitzer Prize in 2003 for his work, On the Transmigration of Souls (2002), which is dedicated to the memory of the victims of the 9/11 terrorist attacks. John Adams continues to compose to this day (his most recently published work was City Noir (2009)) and I think that he will be recognized as one of the most significant composers in the history of American art music and even the World. Part of what draws me to this composer is the fact that his compositions are always in keeping with the modern trends in music. His use of electronic instruments in his pieces adds a modern feel to his pieces and I think that it is really important for the world of classical music to adopt newer technologies. John Adams's minimalism is really great because it seems so epic in scale. Adams's minimalism can be contrasted with the minimalism of Steve Reich because of its scope. A lot of the music Steve Reich is "phase music", where a recording is continuously looped and duplicated over itself. I like Adams's minimalism because it combines recorded materials with live acoustic instruments. One that I really prefer is known as Light Over Water (1983), which is a three-movement minimalist symphony with seven brass players and synthesizer. Adams keeps our interest in this piece by experimenting with funky rhythms, layerings, and tone colors between the various brass instruments and synthesizer. Suggested Listening: One of John Adams's most popular pieces is the Fanfare for Orchestra, Short Ride in a Fast Machine (1986). It is in the minimalist style that Adams became so famous for. This Website is John Adams's official website. It features John Adams's Biography, Works, Links & Interviews, information about his book Hallelujah Junction, and his blog known as "Hell Mouth". This website is a fansite about John Adams. It too features a Biography of John Adams, but also has different sections about Adams's opera Nixon in China and Minimalist Music.